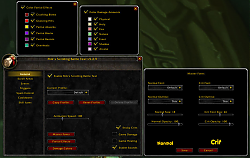 Version 5.7.134 is updated to work with Warlord of Draenor Patch 6.0.2 and fixes the font preview issues. If you are having issues with the fonts "resetting" on initial game load, update to Version 5.7.137. Version 5.7.138 corrects issues with several triggers like Kill Shot and Hammer of Wrath. MSBT is designed to be an extremely lightweight, efficient, and highly configurable mod that makes it easier to see combat information by scrolling the information on the screen in separate, dynamically creatable scroll areas. It is a replacement for Blizzard's Floating Combat Text and Damage output. Scroll incoming damage/heals, outgoing damage/heals, and notifications in separate configurable scroll areas on the playing field. Display player and pet cooldown completion alerts. Display loot alerts with a total of how many are now in inventory. Add triggers that will allow you to show notifications based on a variety of conditions. Assign a sound file to play for events/triggers. Dynamically create new scroll areas and assign any event/trigger to them. Customize the position, size, animation style, enabled state, font style, font size, font outline, and opacity for each of the scroll areas. Customize each individual event's color, font style, font size, font outline, opacity, output message, enabled state, and scroll area. Set "Master Font" settings that will be inherited by all of the scroll areas and the events in them unless they are overridden at the scroll area or event level. Merge AoE data into one event with cumulative damage/healing done with number of normal and crits specified. Show overhealing amounts against yourself or party/raid members. Color unit names according to their class (including CUSTOM_CLASS_COLORS support). Color damage amounts according to damage type. Show partial effects (resists, absorbs, vulnerabilities, etc) colored according to type. Filter output information with a full suite of spam controls. Output your own scrolling messages with the MikSBT.DisplayMessage function instead of having to create your own frame and animation code. You can also use your own font by first registering it with MSBT via the MikSBT.RegisterFont function. See the included API.html file for reference information. /msbt                  Shows the options interface. /msbt reset            Resets the current profile to the default settings. /msbt disable          Disables the mod. /msbt enable           Enables the mod. /msbt version          Shows the current version. /msbt help             Shows the command usage. See the list at MSBT's portal site. If you are capable and interested in being a maintainer for the localization files for a specific language, please send me a PM. The SVN capabilities here at WoWInterface allow me to provide direct access to the localization files in the repository to make the process easier. Moved the new font loader logic into its own frame to prevent issues with UIs such as RealUI that play with opacity on objects they don't own. Fixed unit reaction condition that was preventing many triggers like Kill Shot and Hammer of Wrath from working. Fixed taint issues cause by the _ global variable. Updated options dialogs to remove reference to support for mp3s which the game no longer supports. Corrected an error that occurs on startup with deleted default triggers. Reworked the font handling to preload fonts during initial load to resolve the issue where the fonts would reset to the default on initial game load. Fixed the ability to add custom fonts via the custom media tab. Fixed an issue where the font previews were not updating properly. 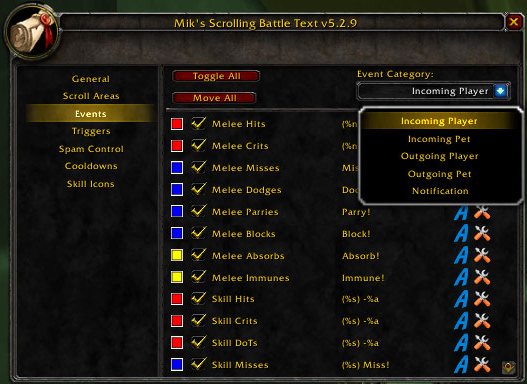 Updated parser to support the new parameters introduced by patch 6.0.2. Modified global constants for item quality to their new values. Removed Berserker Stance from available trigger conditions. Removed Owlkin Frenzy default trigger. Removed Power Guard default trigger. Removed Rune Strike default trigger. Removed Solar and Lunar Eclipse default triggers. Modified several skill IDs to reflect their new values. Updated TOC for Patch 6.0.2. Updated TOC for Patch 5.4. Fixed issue introduced with Patch 5.3 where dispels were showing the skill performing the dispel rather than the one being dispelled. Increased damage and healing maximum spam thresholds to 100,000. Added default trigger for Ultimatum. Updated TOC for Patch 5.3. Updated parser to support the new amount parameter on applied and removed auras. Thanks to pelf for the patch. Fix issue introduced with Patch 5.2 where dispels were showing the skill performing the dispel rather than the one being dispelled. Modified skill ID for Taste For Blood to reflect the new value. Updated TOC for Patch 5.2. Updated TOC for Patch 5.1. Fixed issue introduced with Monk Chi changes in Patch 5.1. Fixed an issue where certain power types such as Sha Power and Alternate Power were causing errors. Added new Shadow Orbs Change and Shadow Orbs Full events that act similar to combo points. Removed shadow orbs from standard power gains (e.g. +1 Shadow Orbs) since it is now treated similar to combo points. Removed Shadow Orbs x3 default trigger due to the new Shadow Orbs Full event. Fixed issue where the shorten numbers and group by thousands options were not being applied to overkill amounts. Added default trigger for Blindside. Removed extra exclamation point from druid berserking default trigger. Added missing Italian localization files. Fixed issue where combo point gains and full combo points were not being displayed (reported by dondasch). Monk is now an available class for triggers and class coloring. Added new Chi Change and Chi Full events that act similar to combo points. Added support for dynamic max chi and holy power. Removed chi from standard power gains (e.g. +1 Chi) since it is now treated similar to combo points. Updated supported power types to include Alternate, Dark Force, Chi (Light Force), Shadow Orbs, Burning Embers, and Demonic Fury. Rewrote code that deals with party and raid members to use the new Blizzard APIs. 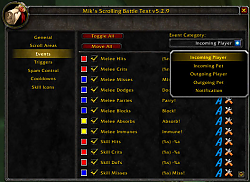 Updated "Active Talents" trigger condition to use the new Blizzard API. Modified remaining existing triggers to work with their new values. 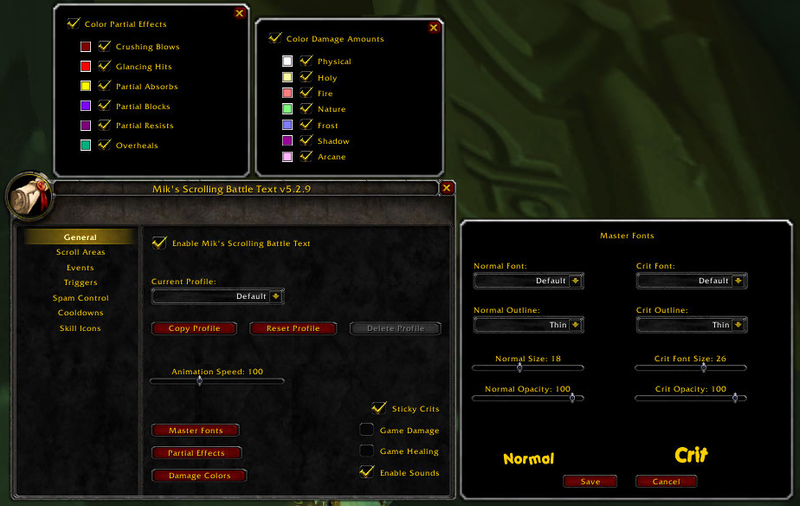 Added default trigger for Vital Mists x5. Added default trigger for Mana Tea x20. Added default trigger for Elusive Brew at 5, 10, and 15 stacks. Added default trigger for Power Guard x3. Added new events for Alternate Power Gains and Losses so they may be customized. Added temporary workaround for UnitGUID bug when in a group. Triggers that involve party/raid members will not work currently due to this. Updated environmental damage handler for environmental type changes. Updated TOC for Patch 5.0.4. Added new option to shorten large numbers using si suffixes (32765 displays as 33k). Added new option to separate large numbers into digit groups (32765 dispays as 32,765). Converted class names to use Blizzard provided localizations. Removed old temporary workaround for raid flags added in Patch 4.2. Money strings will now show properly on all supported languages. Updated Simplified and Traditional Chinese translations from yleaf. Converted all sounds to .ogg from .mp3. Modified combat event log parser to work with the absorb changes in Patch 4.3. Updated German translations from mojosdojo. Updated TOC for Patch 4.3. Created new event for customizable item cooldown notifications. Added Item Cooldown Complete to the available trigger events. Added Item ID and Item Name condition handling for the main trigger events that support them. Cooldown exclusions now accept skill IDs, item names, and item IDs in addition to skill names. Added monochrome, monochrome + thin, and monochrome + thick to available outline font settings for pixel font lovers. Modified the custom font and sound validation routines to work with arbitrary case extensions. Changed custom font validation error message to a more descriptive message when the font can't be set versus the more generic ttf message. 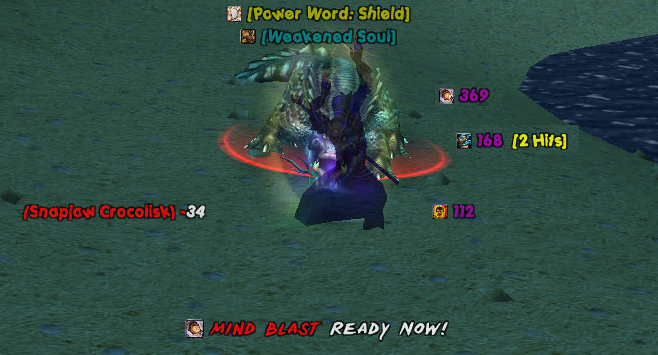 Added option to customize color of shadowflame damage. Added option to customize color of frostfire damage. 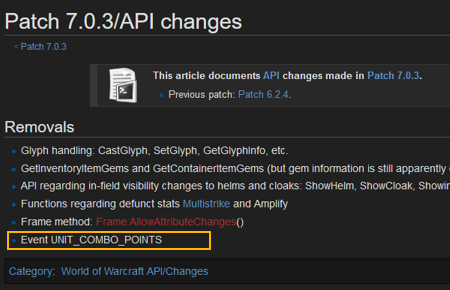 Modified combat event log parsers to work with the changes in Patch 4.2 without extra indirection. Changed Traditional Chinese default font by yleaf. Updated TOC for Patch 4.2. Added logic to detect and merge off-hand strikes with main hand strikes. Removed Happiness as an available power type since it no longer exists as of Patch 4.1. Added logic to handle the changed combat log event format in Patch 4.2 on the PTR without breaking the current version (Blizzard is changing it again). Updated LibStub to the latest version (14 Jan 2011, 1.0.1). Updated CallbackHandler to the latest version (14 Jan 2011, 1.0.7). Updated LibSharedMedia to the latest version (05 Nov 2010, 3.0-4). Fixed handling for the always show quest items option that was broken by Patch 4.0.6 (reported by Judgespear). Modified to play sounds even when game sound effects are disabled as allowed by API changes in Patch 4.0.6 (reported by Retlaw). Modified combat event log parsers to work with the changes in Patch 4.1 (committed by mojosdojo, reported by several others). Updated Russian translations from StingerSoft. Updated TOC for Patch 4.1. Added the new pet heal events to the options interface so they may be customized and disabled as intended. Updated Korean translations from chkid. Implemented a work around for Blizzard's cooldown bug with dismissed pets. Pet cooldowns should no longer be shown before they are actually finished. Created new event for customizable pet cooldown notifications. Added an option to customize the color of the skill name in cooldown events. Changed Skill Cooldown Complete trigger event to Player Cooldown Complete (only detects player cooldowns). Added Pet Cooldown Complete to the available trigger events. Added Skill ID as an available condition for player and pet cooldown triggers. Created new events for outgoing pet heals, pet heal crits, pet periodic heals (HoTs), and pet periodic heal (HoT) crits. Efflorescense is now detected and displayed as a pet heal. Added default triggers for Blood Swarm and Shadow Infusion x5. See the included readme.html for further version history. I regret that I had to switch to parrot. I managed to set it up almost identical to my former MSBT profile. (*temporary) = "attempt to call field 'RegisterAnimationStyle' (a nil value)"
(*temporary) = "attempt to call field 'Enable' (a nil value)"
Everytime i login, i get an addon error for this - Here is the error: I use Altz UI as the main but I prefer this SCT. Any help will be appreciated. I made a DK today - first time I've played a non-healer in ages. And noticed while AoE spells like Howling Blast are being merged, the MH and OH damages of Obliterate or Frost strike are not being merged. Any ideas? Is it a setting I missed, or does the code related to MH/OH strikes need to be fixed? If you could point me to which file said code is in, I could take a look at it myself, I just don't really know where to being with the file layout of msbt. My Addons | "If someone says something is impossible, they either lack imagination, or lack determination." Nice Addon just my mind works better with commas. Re: Medal icons in notification window? Hey thx for a great addon, love it to bits. window. I probably have something wierd in the setup but i cant seem to find it. After having turned off MSBT and logging in then re-enabling the addon the problem seemed to go away. Then it came back in another session. It seems to be a recurring failure with the Titan [Reputation] (+Glamour) addon. I did a /reload ui after I logged on and it went away. Do you have Titan [Reputation] (+Glamour) ? have you tried reloading? does it go away for you too? Edit: subsequently playing around with Titan [Reputation] (+Glamour) - (I used to used bazooka and recently changed to titan panel), there is an option within this addon to 'use MikSBT for announcements' just uncheck this option. Last edited by Gyver : 08-27-16 at 09:37 PM. Medal icons in notification window? Last edited by AdriiTheGamer : 08-08-16 at 02:31 PM. I log in and my notifications are in Scurry and then blam! Coak of Shadows. The nasty Porky bug is back. Last edited by Deadlyz : 08-04-16 at 06:51 AM. Looks like that's the key to fixing MSBT combo points trigger. Last edited by Deadlyz : 08-04-16 at 03:49 AM. I don't get notifications for my combo points. It supposed to say how much CP I currently have and then when im at full to say FINISH IT. But that never happens. I've check in the options and it is enabled. Anyone with the same problem or a solution? I can only guess why that happens. Last edited by Deadlyz : 07-29-16 at 03:20 AM. where do you get the .144 build? Hi! MSBT doesn't show combo points I gain.